Where Did All The Photos Go? Those of you who visited the old Michaela August site seemed to be very fond of the slideshows I had posted, with photos of locations from the novels, as well as other items related to the settings of the novels. So, where did all the photos go? Fear not–my web designer is still in the process of migrating over content from the old site, and the Worlds pages will be returning soon, in a slightly different format, but with all of the photos of medieval, Moorish, Turkish, and Roman sites intact, as well as the Sonoma Valley wine country photos. 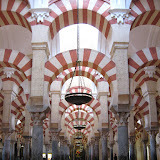 In the meanwhile, here’s a new slideshow, from a recent trip to Cordoba in Spain, that includes photos of medieval Moorish houses, complete with courtyards and interiors (and even a visit to an ancient basement that used to be the ground floor of a Roman villa…just like in some of the Houses of the Rose). These houses resemble the one in 13th-century Moorish Kingdom of Granada, where young Robert was fostered in Queen of Heaven and The Shattered Crown. I had the opportunity to spend some time in Granada on this trip, with an afternoon spent wandering around the fortress and palaces of the Alhambra. I’ll post those photos in a few days. Glad you made it there too! It is indeed a rearakmble place, as I’d mentioned in an earlier post. Can you imagine living there when it was at its cultural height? It seemed futile for the Reyes Catolicos to attempt to change Morrish splendor like this into any kind of celebration of the Church. It was just impossible to over-write the lush mid-eastern influence. It is a profound experience to enter the massive studded gates of the Hall of Justice and stand there below the immense gallery, open to the dommed roof, and imagine being hauled in there accused of anything to stand before judgement of the Sultan. His throne room was no less imposing. And those in contrast with the delicate screened passageways and elegant hidden rooms of the harem. What atmosphere!